At first glance, Asian Handicaps look like one of the more complex areas of football betting. But, as James Eastham explains, they're fairly straight-forward and can offer exciting new betting angles. Asian handicap betting means betting on the outcome of a football match where the two teams are given a handicap - which can be positive or negative - before the game starts. The handicap is a figure such as +0.5 or +1.0 or +1.5, or -0.5 or -1.0 or -1.5. This figure represents a goals headstart or a goals deficit awarded to the teams before kick-off. If Manchester City are travelling to Burton Albion for a cup game (see graphic above), City will be a very short price to win the game - say, [1.2]. A price like that means very few people will be interested in betting on a City win. Burton will be a very long price, and very few people will be interested in betting on a Burton win. This is where the Asian Handicap comes in. On the Asian Handicap market, City will be given some sort of negative handicap, such as -2.5. This figure represents a goals handicap before the game - literally -2.5 goals. That's the handicap City start the game with. Burton, meanwhile, will be given a positive goals handicap, such as +2.5. So you have to overcome the handicap to win your bet? Exactly. So if you've bet on City -2.5, you need them to win by three goals or more to win your bet. If you've bet on Burton +2.5, you need them to avoid defeat by three goals or more to win your bet. You basically add the handicap to the actual scoreline that occurs in the game. That's one of the advantages of the Asian Handicap - it can add interest to a game where the outcome is considered a foregone conclusion. In our example, Manchester City -2.5 would be a bigger price than on City simply to win the match. Is there only ever one handicap per game? No - for any given game there are plenty of different positive and negative handicaps for you to pick from. 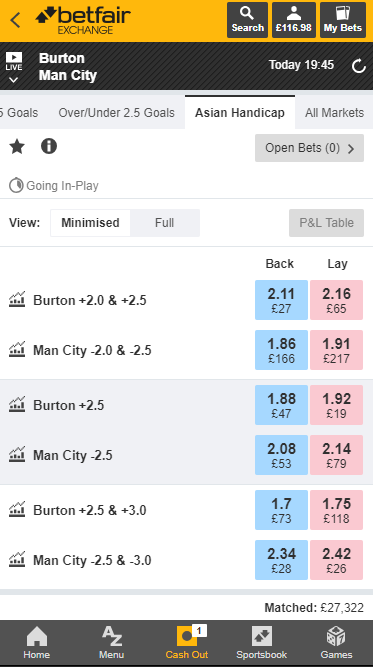 For Burton Albion v Man City, you'd find Man City -2.0, Burton Albion +2.0, Man City -2.5, Burton +2.5, and so on. The handicaps available reflect, to some degree or other, the relative strengths of the teams. And the odds for each handicap will differ, of course. The odds on Man City -2.0 would be shorter than the odds on Man City -2.5 because Man City stand a better chance of overcoming a -2.0 start than a -2.5 start. Say the Asian Handicap I've picked is a round number - e.g. -1.0 or -2.0 - as opposed to a half number, and the handicap gets equalled by the actual scoreline in the game. What happens then? In that case you simply get your stakes back. Imagine you back Man City -2.0 v Burton Albion. City win 2-0. The handicap has been equalled, so your stakes will be returned. What about Asian Handicaps like +2.0&+2.5 where two numbers sit together. What's that about? It looks complicated but it's really not. With this sort of Asian Handicap bet your stakes are split equally across the two handicaps listed. Let's say you bet on Man City-2.0&-2.5 against Burton. Half your stakes go on City with a -2.0 goal start, the other half on City with a -2.5 goal start. As always, you simply add the actual scoreline from the match to the handicap bet you've placed. So if City draw or lose the match, your bet loses, because you've failed to overcome the handicap. If City win by two goals, you lose half your stakes (the half placed at -2.5) and get half your stakes back (the half placed at -2.0). If City win by three goals or more, your entire stakes win. Do you only find Asian Handicap on games that the market considers a mismatch? No, you find Asian Handicap bets on all sorts of matches, including games that are likely to be closer. On a game like Chelsea v Arsenal, you might have a sneaking suspicion Arsenal will win but you're not 100% confident. By backing Arsenal +0 Asian Handicap, you give yourself the safety net of getting your stakes back if the game is a draw. In this instance, the +0 Asian Handicap market works exactly the same as the DRAW NO BET market. Can you bet on the Asian Handicap market in-play and use it for trading? Yes you can. During a football match prices on the Asian Handicap change according to match circumstances. In this sense you can use the Asian Handicap market to trade exactly as you would any other football market - i.e. you can place bets before the game because you think it will offer cash-out opportunities, or you can use the Asian Handicap market during the game in order to lock in a profit.